Those of you who are not aware - Soulflower is a brand in India which offers 100% natural products with no artificial ingredients. They have soaps (all around 250 INR each), massage oil, bath salts, essential oils and the like. The products are found at their website and also at Shoppers Stop. So far, organic/herbal only meant buying from Khadi or FabIndia. Spending more than a hundred bucks for a organic shop sounds stupid. Soulflower was hence ignored by me all the time. But, I needed to move away from my TBS Rainforest shampoo and try other cheaper alternative for SLS free shampoo. 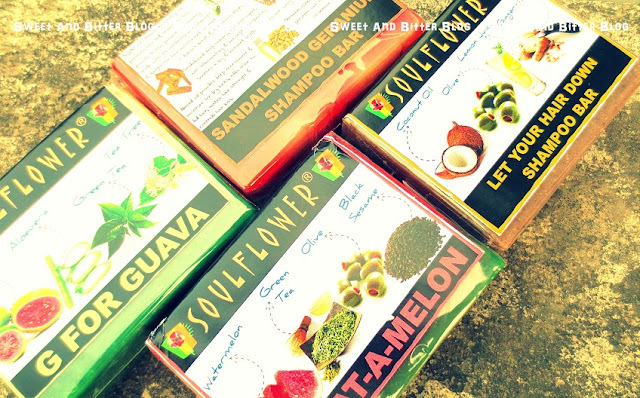 From my list of SLS Shampoo in India, I had 2 soaps from Soulflower suitable for me. The soaps at soulflower are around 250 each. So, when I found them running a women's day offer - All soaps at flat 149 INR - I could not resist. I added a lot of soaps because I needed fresh smell for summer as I was cleaning my wardrobe and my cart was blown to 1500 INR! Then I searched for a loads of reviews and realized that the smell does to transfer to skin. So, I kept my list to only 2 body soaps. Final List - 2 Body Soap and 2 Shampoo Bars. Soulflower G for Guava Soap - never tried a soap with Guava smell. I love fruits for shower/soap. 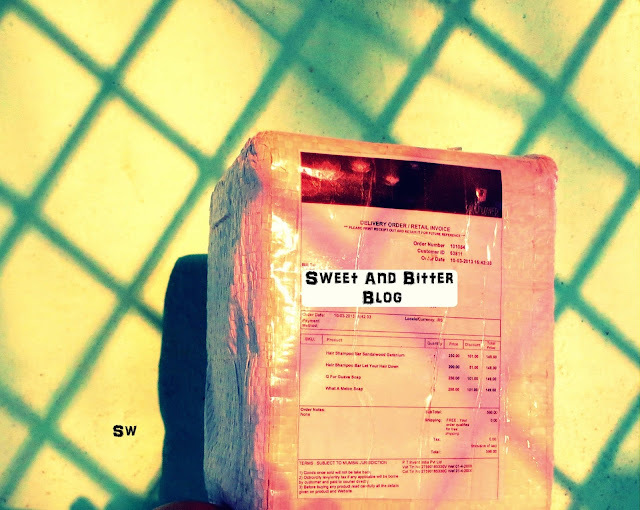 Soulflower What A Melon Soap - Sounds yummy! WaaaaateeeerMeeeelooooon. The website is easy to browse. Lot of categories are there for filter. Everything - ingredient, how to use, benefits are mentioned clearly with the products. Not happy with the soaps available? Then you can make one for your own needs. The ingredients benefits are price are clearly mentioned. Do have a look here - Make your own Soulflower soap. Fast Shipping - I ordered on 10th March (Sunday) around 5 PM. I got a mail that the products were shipped with courier details on 12th around noon and the courier guy delivered it by 13th afternoon. Great Packaging - They had a knitted plastic (what is it called?) wrapped around the main box. The box had the products in bubble wrap and had additional thermocol sheets for support. I have never seen such dedicated packaging from any online shop. I must say it was great. I would surely shop from them again. I recommend say that you like their FB page as they come with offers very often. This is the first time I will be trying anything from Soulflower. 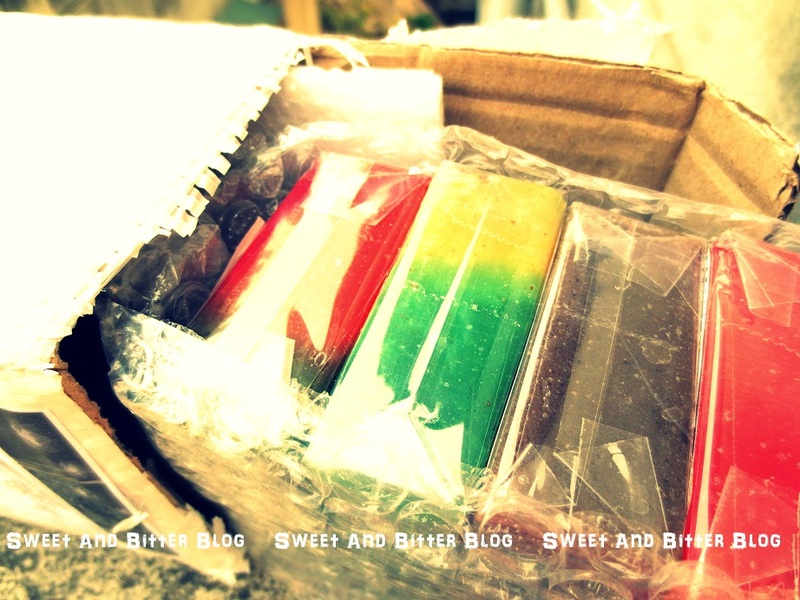 Do you have any favorite? Do share so that I can check on them next time. I love th Soulflower scrubs. Started using them around 8-9 yrs ago when they had newly launched in India (its a Thai brand I believe) and was only available at the Bombay Store. Will chk out their online store.